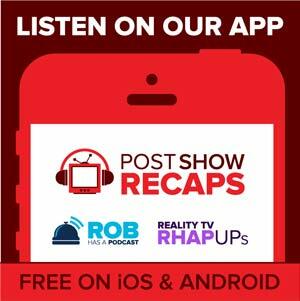 Rob Cesternino and Akiva Wienerkur are great with the mothers, but even better with podcasting, so they continue to bring a new Seinfeld Post Show Recap each and every week. 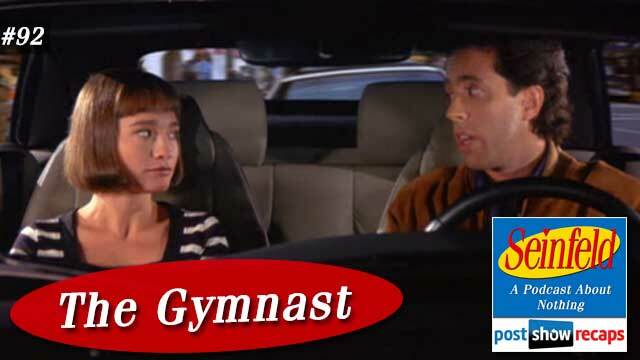 This time, they discuss “The Gymnast”, which first aired November 3, 1994 as part of season six. The episode was written by Alec Berg and Jeff Schaffer, who both would later go on to write on Curb Your Enthusiasm. Schaffer and his wife would also create the FX show The League. Seinfeld related news – Akiva wanted to talk further about his favorite parts of Larry David on Saturday Night Live last week. Rob agreed it was the best SNL of the season so far. Akiva also had an email from a listener who pointed out that Akiva mentioned in a season four podcast from this summer, how it would be great if Larry David hosted SNL, but it would never happen. Jerry’s Story – Jerry starts dating Katya, a former Romanian gymnast, who Kramer has encouraged him to sleep with for her flexibility. His problem is, they have nothing to talk about. Once he finally does sleep with Katya, it was underwhelming, and now he’s lamenting having to stay with her a few more weeks because of it. Jerry decides to take Kramer with him and Katya to the circus, where her friend Misha is performing the tight rope. At the end of the episode, Katya breaks up with him, explaining that in Romania, the comedian is supposed to be the most sensual lover imaginable and he was “no comedian” in that regard. George’s Story – George is still dating Lindsay, despite the snafu with the book club. In the opening scene, we learn that George takes his shirt off when going to the bathroom, an important plot point for later on. He is going to a party at Lindsay’s mother’s apartment, which is great for George, since he’s always done well with mothers. He charms at the party until the end, when Lindsay’s mother catches him eating an éclair out of the garbage. After talking his way out of it, he is then caught by the mother cleaning a windshield like a “bum”, but only because he accidentally threw his coffee out on it. His last chance is quickly blown when at another party, he emerges from the mother’s bathroom without a shirt, having been mesmerized by the 3D art hanging in there. Elaine’s Story – Elaine spends much of the episode trying to keep Mr. Pitt focused on the Molland Springs water merger, though Kramer’s 3D art has him distracted. When the merger meeting is about to happen and Mr. Pitt can’t tear himself away from the 3D art, he send Elaine, who inadvertently criticizes Mr. Pitt’s idea for the new water name. In the subsequent meeting to decide on the new name, Mr. Pitt rushes there in a beige horseback riding outfit, covered in ink from Elaine’s fountain pen he warned her not to use. The most unfortunate part is the ink smudged on the middle of his upper lip, making him look just like Hitler. Kramer’s Story – Kramer battles a kidney stone through much of the story, but he starts out getting everyone hooked on staring for the image hidden in the 3D art. The kidney stone wreaks havoc throughout, causing Kramer hilarious spasms. After he effectively transfixes Mr. Pitt with the 3D art phenomenon, he goes to the circus with Jerry and Katya, where the kidney stone finally makes it way out. His howling from the pain causes Katya’s friend Misha to fall from the tight rope, though Kramer dances out of the bathroom, finally experiencing the relief. Rob and Akiva Tangents – In the opening, Akiva shared his opinion on the Jeff Schaffer show The League, revealing it will not be covered in 2018 when they are done covering Seinfeld. They discussed why George would prefer to take his shirt off in the bathroom, thinking the back of the toilet would be cold on the back. Rob actually discovered a movie Akiva has seen when he talked about the movie Mallrats having a similar 3D art storyline. Akiva shared a story about his weird former principal who made him get help as he was suffering similarly as Kramer from a kidney stone at school one day. Lastly, they talked about how they consistently give their wives the answers they want to hear, whether it’s the truth or not. What wouldn’t work in 2016 – 3D art is nonexistent today, and not too many homeless are washing car windows in 2016. Also, the Olympics are readily available on YouTube. Letter grades and ranking – Akiva thought Jerry had a weak storyline, giving him a C+. He enjoyed George’s story, giving him an A, as eating out of the garbage is legendary. Kramer deserved an incomplete, since he had so little to do with the main plot. Lastly, they gave Elaine a B, since they enjoyed Mr. Pitt’s part. Akiva thought this was an average episode, ranking it at 82. Special Guest Shawn Falconer – Shawn is a faithful listener to the podcast who developed a program that could pull out all the questions they have had over the 91 podcasts for the fake interview with Jerry. In addition, he was able to track other fun tidbits, like how many times they say the characters’ names and other words and phrases. Akiva asked some impossible to answer questions, and Shawn also shared he wanted to find out how many times they complained about their wives. Emails – Johnny De Silveira noted how the actress who played Katya was also in Schindler’s List. Dr. Thomas the medical correspondent wrote in to share how Kramer was correct in talking about the kidney stone symptoms. Lindsay wanted to share how she has finally caught up on the podcasts, and wondered if Kramer’s fear of clowns really did start with “The Opera”. Michael Clark thought the guy who had coffee thrown on his windshield was overreacting, since he could just use the wipers to clean it off. Amir wondered since when does Jerry care about a girlfriend’s feelings, since his method has always been to be shallow. Raul Castillo asked if podcasters have a lot of groupies. Rob wondered where he came up with the question, while Akiva thought perhaps Marc Maron might, though they certainly don’t have any. Finally Chester wanted to share how he believes this episode is one of the all time greats. He also pointed out how Elaine is as bad an employee as George ever is. Akiva agreed, noting how she does far worse things than she already has done to Mr. Pitt. He lastly asked if Seinfeld created a phenomenon of not wearing shirt in the bathroom, to which Akiva and Rob both agreed it’s not a thing to proudly carry on. Tune in next week as the guys will recap “The Soup” where the guys will try to determine if soup is a meal. Send in your questions by emailing [email protected] Don’t forget to subscribe to the podcast by going to postshowrecaps.com/seinfeldITunes where you can rate and review the podcast. You can get a discussion going about the podcast by leaving a comment on the show page, and as always, you can follow them on Twitter @robcesternino and @keev26.